Let's get real. Most of the time when you buy a present for someone it is something you would like for yourself. So why pretend? Here are some awesome sets for YOU to enjoy. Holidays sets are unique, limited edition for the season, and are a great value (saving $$ = the best reason to buy them). But watch out they sell out fast - the popular ones waaaaay before Christmas! 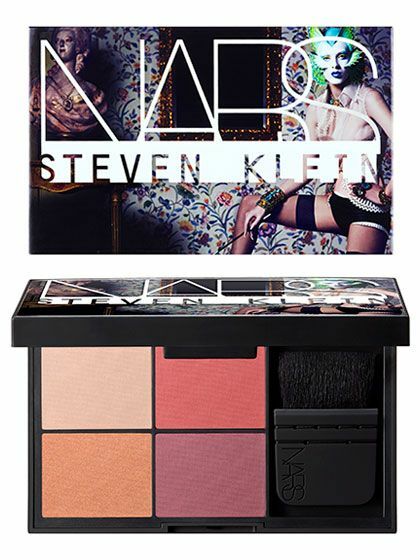 NARS Steven Klein FANTASCENE Despair Cheek Palette with the famous (mini) kabuki ita contouring brush. Steven Klein is a fascinating photographer and his influence is felt here in the cool packaging. The 4 stunning holiday blush shades include a natural glow, a gilded apricot, a rouge coral, and a flushed primrose: three are exclusive to this palette. NARS is known for their blushes and these colors look much better in person. Philosophy Christmas Cook Book Collection is full of fun and yummy holiday scented shampoo/shower gels/bubble baths. Maybe I'm too old to like sweet things but hey, I do. So these 4 oz vanilla bean nutmeg, pumpkin icing, cinnamon stick, fresh cream scents are a treat for me. Of course any of the Philosophy gift sets (they have skincare) are a good idea. Sephora sells them too but if you buy them from Nordstrom's right now it is 10% off and free shipping. Too Faced Melted Kisses & Sweet Cheeks is the most adorable of all these sets. In the princess packaging are three of their best-selling Melted Lipsticks and three of their long-wearing Love Flush Blushes. The color selection is to die for - a little bit of flattering something for everyone. I can't say enough good things about this one. 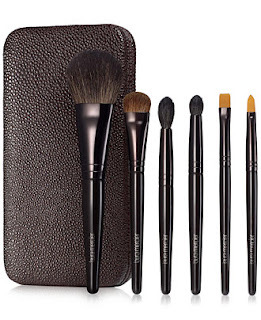 Laura Mercier Stroke Of Genius Luxe Brush Collection is six brushes of superb quality. 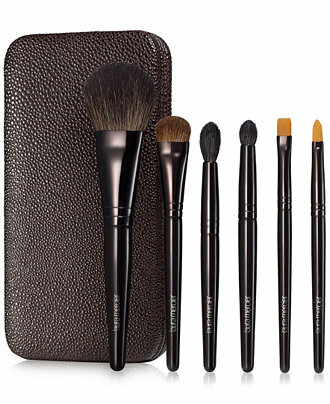 Includes flat eyeliner, eyeshadow crease, all over eye color, cheek color brush, pony tail brush, secret camouflage brush. I like the easy to use short handles combined with the full size brush heads. The hard, sleek case is beautifully nubby and perfect for travel or to keep handy on your vanity top. And I love two irresistible exclusive-to-Sephora lip collections. If you don't like a color or two give them away to friends and family, you'll make their day. But don't forget a girl can never have too many lip glosses! 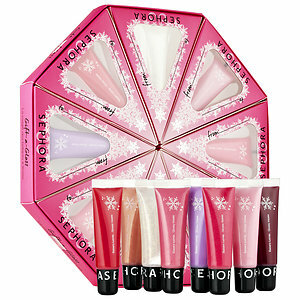 (1) Sephora Collection Gift-A-Gloss Lip Gloss Sampler 8 oh-so-pretty glosses in Crystal, Frosted Pink, Juicy Pink, Festive pink, Sheer Lilac, Soft red, Shimmering Coral, and Holiday Berry. With all the super pigmented liquid lipsticks taking over the market these days I find it refreshing to still use traditional glossy gloss. They are marketed to give as gifts but I need them all! And totes adorable packaging! (2) Buxom Leave Your Mark Full-on Lip Polish & Lip Cream Set is 15 minis: 8 Full-on Lip Polishes (sheer shimmering plumping) and 7 Lip Creams (more opaque but still plumping) all with their usual coquettish names. Includes crimsons, nudes, even a few purplish, and of course many different pinks. Buxom is a favorite of everyone. Now "what about eyeshadows?" you ask. Well, not to sounds too jaded - they are all fine - but I'm not in love with any of them as I am in love with the products listed above. 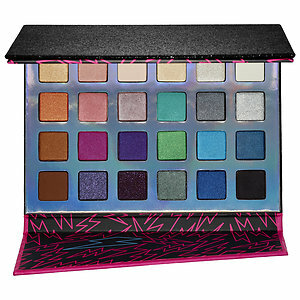 I admit the Urban Decay Vice4 Palette has the most spectacular packaging but when swatched, the insides were not my favorite of the Vice Palettes. And Too Faced has exquisite packaging however the quality of some of the shadows themselves are weak. I would say if you want something along those lines color-wise and with quality, go for Jem And The Holograms: Truly Outrageous Eyeshadow Palette. 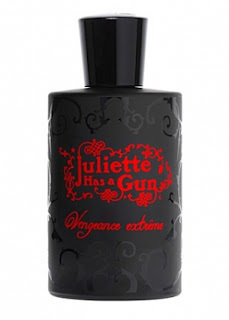 Exclusive to Sephora, it is getting rave reviews.